SAN FRANCISCO--(BUSINESS WIRE)-- Visa (NYSE: V) and a consortium of key industry organizations today announced Digital Transformation of SMBs: The Future of Commerce, a first-of-its-kind look at the opportunities and challenges small and medium size business (SMBs) owners face in an increasingly digital world. The report provides a snapshot of how SMBs can capture revenue opportunities and move to more technology-focused processes. Developed with leading SMB advocates, the report also offers actionable tips for technology and digital upgrades that business owners can easily implement to grow their businesses. One immediate opportunity for SMBs to go digital is by digitizing checkout and other business processes. Based on survey responses, Visa estimates that the SMBs’ average cost of processing digital payments, inclusive of direct expenses and labor costs, is 57 percent less than that of non-digital payments. Further, 65 percent of SMBs agree customers spend more when they use cards versus cash. 78 percent of consumers surveyed rank a digital payment method, such as paying with a card or mobile device, as their number one preferred payment option. According to the report, consumer purchasing behavior is driven in part by websites and online experiences. More than half of consumers (51 percent) wish they could shop exclusively online. This has big implications for SMBs, given only 46 percent of SMBs surveyed have an online presence, such as through a business website or online marketplace. Today, 38 percent of consumers’ retail purchases are made online, but that number is expected to grow, as 61 percent of consumers plan to increase their online purchases in the next 5 years. As online purchases continue to increase, it could exacerbate a widening gap, given only 15 percent of SMBs’ sales are conducted through digital channels. Only one in five SMBs surveyed offer a loyalty program, yet rewards drive consumer preference and digital programs can offer instant value and gratification. 78 percent of consumers are more likely to choose a business that offers a loyalty program over one that does not and 65 percent of consumers surveyed said they examine loyalty programs prior to shopping at a store, visiting a restaurant, or trying out a service. 90 percent of consumers prefer a digitally based loyalty program compared to a paper-based stamp or punch card. Nearly 80 percent of businesses say loyalty programs have a positive impact on average ticket size, repeat customers and revenue. The Digital Transformation of SMBs report is an independent study commissioned by Visa in collaboration with a consortium of trade associations, technology providers, banks and researchers to help bridge the gap between consumer expectations and current SMB offerings. Consortium includes: America’s Small Business Development Center, National Federation of Independent Businesses, National Restaurant Association, U.S. Hispanic Chamber of Commerce, ESI ThoughtLab, Authorize.net, Bank of America Merchant Services, BB&T, Capital One, Clearent, Elavon, iPayment, Maru/Matchbox, Pivotal Payments, Priority Payment, Square, TSYS, U.S. Bank, Wells Fargo and WorldPay. 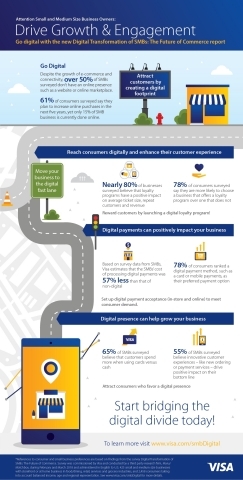 To download the Digital Transformation of SMBs: The Future of Commerce report and learn how to begin growing your business, visit www.visa.com/smbDigital. Maru/Matchbox, a global consumer intelligence firm, surveyed 425 businesses that represent business payment decision makers and nearly 2,500 consumers in 2018 to form the Maru/Matchbox 2018 Small Business and Consumer Surveys. ESI ThoughtLab, a leading economics consultancy firm, collaborated with Visa to develop equations that enable the cost analysis to realize the impact of digital versus non-digital payments. Visa Inc. (NYSE: V) is the world’s leader in digital payments. Our mission is to connect the world through the most innovative, reliable and secure payment network - enabling individuals, businesses and economies to thrive. Our advanced global processing network, VisaNet, provides secure and reliable payments around the world, and is capable of handling more than 65,000 transaction messages a second. The company’s relentless focus on innovation is a catalyst for the rapid growth of connected commerce on any device, and a driving force behind the dream of a cashless future for everyone, everywhere. As the world moves from analog to digital, Visa is applying our brand, products, people, network and scale to reshape the future of commerce. For more information, visit usa.visa.com/aboutvisa and @VisaNews.